This year, instead of shaving my head and donating my hair, I will be participating in the Make-A-Wish® Rope for Hope! 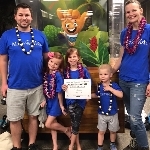 In June 2019, I will be rappelling down from a great height to help grant the wishes of children living with life-threatening medical conditions! As most of you know, in November of 2017, my daughter Maddie was granted the wish of a lifetime by Make-A-Wish and now it’s our turn to help other kids like her! Please help support my small attempt at replicating the courage these amazing kids show every day fighting their personal battles!